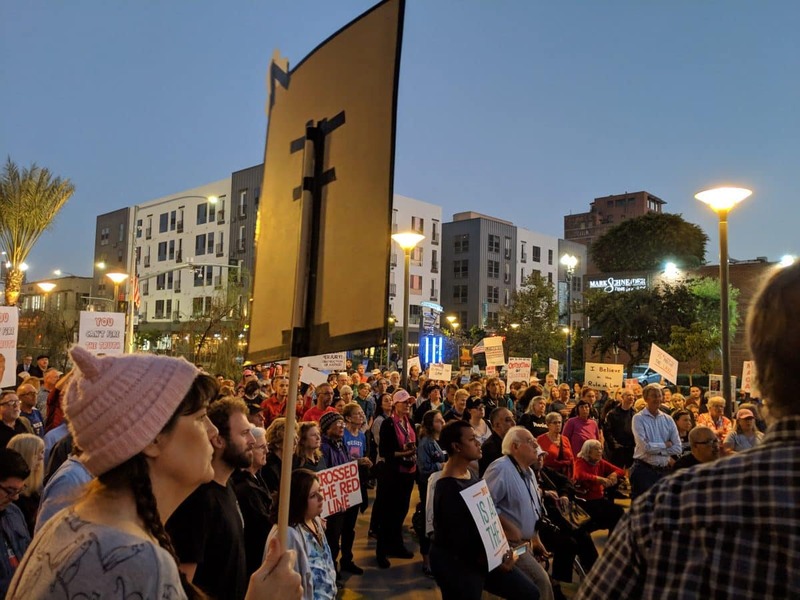 Protesters gathered at Harvey Milk Plaza to protest and demand that Congress protect the investigation into Russian interference with the 2016 election on November 8, 2018. Photo by Valerie Osier. Ostensibly, they had gathered because of the forced resignation of former Attorney General Jeff Sessions, in actuality, they had come to demand that special counsel Robert Mueller’s Russia investigation be allowed to go forward. Jacqui Viale had known this day would come. 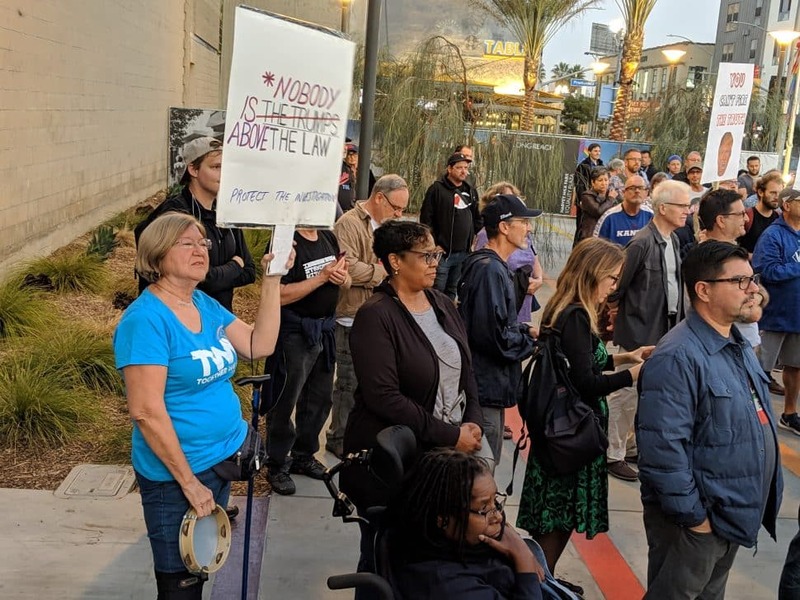 She had been signed up to host a “Nobody is Above the Law” protest in Long Beach for over a year, but she didn’t know exactly when it would happen. She’d been waiting for President Donald Trump to cross one of four “red lines”—including Mueller being fired or Deputy Attorney General Rod Rosenstein being replaced—before she and hundreds of other organizers across the country would have a “break glass moment,” triggering hundreds of protests. “When Sessions was fired—and there’s no getting around it, he was fired—and then he took Rosenstein out as the next person in line, we knew that was a line he crossed because we knew he was trying to thwart the investigation,” Viale said. 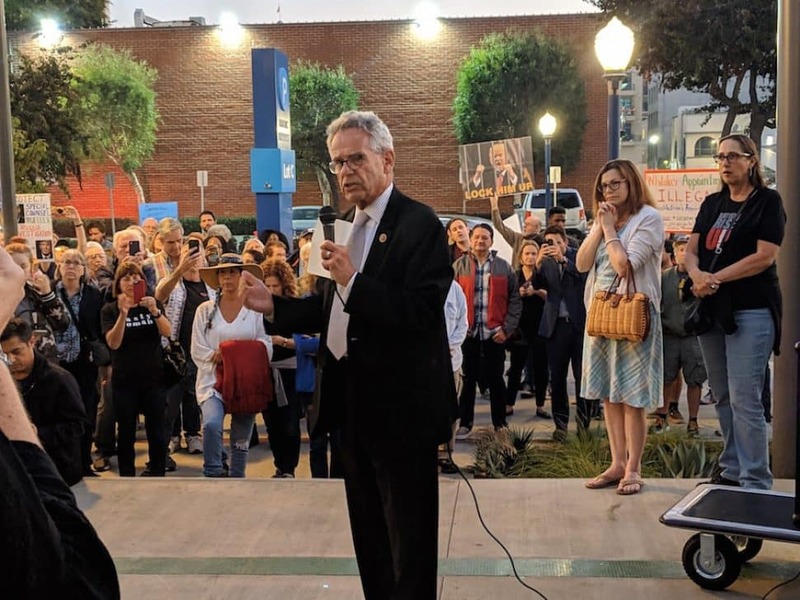 She and the nearly 300 protesters at Harvey Milk Plaza were reassured by Long Beach Congressman Alan Lowenthal, who made a surprise visit to the protest, that Congress would ensure they would protect the investigation. For many protesters, they were worried the resignation of Sessions was a foreshadowing of things to come. Hours after the midterm elections handed the Democrats the House of Representatives, President Trump forced Sessions to resign as Attorney General on Wednesday. Within 24 hours, activists from Move On had organized protests nationwide. Viale said the protesters are worried Trump will be able to snuff out the investigation because he installed former Sessions chief of staff Matthew Whitaker, who many view as an ally of President Donald Trump and an outspoken critic of the investigation, as acting attorney general. “We’re demanding that Whitaker be removed or recused himself and want our representatives to stand up like they’ve never stood up before,” Viale said.